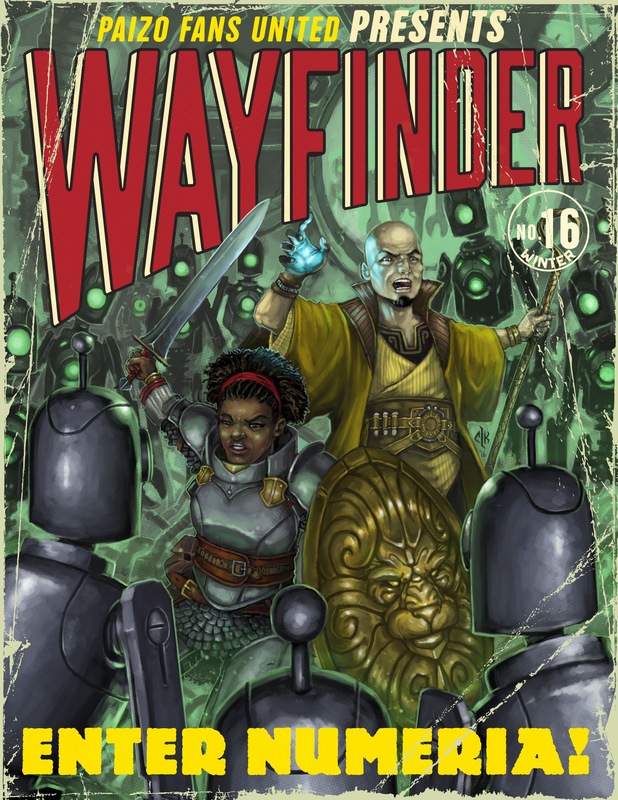 Created for Pathfinder fans by Pathfinder fans, this sixteenth issue of the ENnie Award-winning Wayfinder fanzine is a technological wonder, exploring all the sci-fi weirdness that is Numeria! This free fanzine includes dozens of articles, including original fiction, new monsters, adventures, classes and options, magic and technological items, and even a new game—this is just a small portion of what awaits you! Contributing Authors: Gabriel Almer, Kate Baker, Matt Banach, Jason Owen Black, Dave Breitmaier, Jeremy Clements, Jeremy Corff, Chuck DiTusa, Matt Duval, Natalie Ellis, Robert Feather, Jon Forrester, Spencer Giffin, Wojciech Gruchala, Violet Hargrave, Jeffrey Hersh, Eric Hindley, Nicholas Hite, Andrew Hoskins, Brian 'Ehn' Jolly, Cailean Keith, John Laffan, Thomas LeBlanc, Isabelle Lee, Jeff Lee, Zack Litchfield, Ben Martin, Jacob W. Michaels, Matt Morris, Matt Roth, Elliot Smith, Kendra Leigh Speedling, Jeff Taft, Ian Turner, Brendan Ward, and Kelly Youngblood. 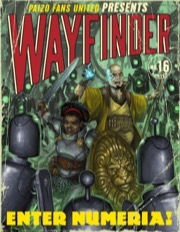 Wayfinder #16 is a 72-page full-color PDF suitable for printing or viewing on your computer. It is released under the Paizo Inc Community Use Policy. This fanzine uses trademarks and/or copyrights owned by Paizo Inc, which are used under Paizo's Community Use Policy. We are expressly prohibited from charging you to use or access this content. This fanzine is not published, endorsed, or specifically approved by Paizo Inc. For more information about Paizo's Community Use Policy, please visit paizo.com/communityuse. For more information about Paizo Publishing and Paizo products, please visit paizo.com. A lot of people just got the Iron Gods AP through the Humble Bundle thing. This would be a good companion for anyone thinking of running Iron Gods, I think. Huzzah! From the glimpses I got while editing and proofreading, this looks to be an awesome issue of Wayfinder. There is a lot of good content (archetype, seeds, android options and one hook for one of the Iron God Books). I need to look at it more indepth, but I would say a must for Iron God or any campaign set in Numeria. I have a specific question about using the "Pursue the Iron Princess" side-trek. "spoilered" to avoid revealing inappropriate details to players. Eric Hindley's adventure is set for 5th level characters; unfortunately, such characters are going to enmeshed in the Lord's Of Rust adventure. The new cover style is AWESOME!!! Well I was going to pop in to begin asking for folks to review, but there already is one, so I will dig deeper. Ah, my first wayfinder, which means this is obviously the best of them all. The Annelidmorph is so weird and awesome! I imagine showing up to character creature with a GIANT PSYCHIC WORM. Issue index has now been updated to include this issue. Most contributions - Artist credits : Carlos Torreblanca with 46 credits, Liz Courts firmly in second position with 40.
Review to follow starting in approximately two weeks, after reading it to enjoy and digest, and then reading it again in review mode. We hope everyone is enjoying this new issue of Wayfinder! It's important to remember that all of it is voluntary.....no one gets paid to do this, they all choose to volunteer their time and talents to make this fanzine. Pretty much the best payment you can give those people? Your feedback. Tell us what you liked, what you didn't, and please consider writing a review on the product page, or your own blog or posts. For many of the writers and artists, this is their first published piece! They are on the cusp of entering the RPG industry, so feedback is critical to them. So, please tell us your thoughts on this issue, or any issue of Wayfinder you've read. We would GREATLY appreciate it. I haven't had a chance to read much (i.e. anything) yet, but some great art. That cover is fantastic, super pulpy, but also something I feel like I'd pay money for in a Marvel comic. I was going to list some of the other pieces I liked a lot, but there really are too many of them. Beatrice Pelagatti and Carlos Torreblanca's pieces, though, really speak to me (I kept seeing pics I liked and going back to find that one of them had drawn them), as does the bioconverter robot art. I'll have look at the AP volumes and see if I can't come up with some advice for you. Okay, fess up, authors. Who made the worm race and pillbug race in this issue of Wayfinder? Annelidmorph was Ben Martin (art by Catherine Batka), and the Tura was Kelly Youngblood (art by Becky Barnes). We actually listed the authors and artists by the order of the entries this time, instead of alphabetically. That should help ID who did what better, I hope. Maybe they can weigh in here on what inspired them? Oh, nice, and thanks. I didn't pick up on the credit order listing. Good idea! It looks amazing, can't wait to read the stuff I didn't have a hand in editing or proofing! Really proud to be involved in this issue! that the GM relocate the tribe to the Sellen Hills or northern Sovereign's Reach a short distance from Scrapwall. It doesn't HAVE to be in the West. Have Krondarr (or someone from the village) go to Scrapwall looking for some help to mount a rescue. As the PCs explore Scrapwall, they can run into this side trek. They would leave to travel to the village, but it could be within a day's travel. That's a good thought. Another idea I had (again moving the village) would be to have a PC Barbarian (or other Tribal Kellid) invited to go between Fires of Creation and Lords of Rust - They would arrive just in time for the "A Broken Wedding" encounter. That might require lowering some encounter CRs, but not by much. I know it is unfair of me, but I often look at short adventures (including PFS scenarios) as potential "plug ins" for the relevant APs. Am I reading the Siphon Structure spell (page 25 of this issue) correctly? I believe you mean ASTOUNDING! Let the PCs meet Krondarr wandering through Scrapwall, searching for his stolen bride. Alternatively, move the tribe into the city limits and run the opening encounter as written. You can set the dungeon at the entrance to any other mini-dungeon, or add it as a separate location, depending on the needs of your game. Alternatively, you can relocate the tribe and run it between adventures 1 and 2, Krondarr can help even the odds for a lower level party. Obviously Bravam’s Knorr needs to be on the western side of the Sellen (Jovrey knows too much about tech for the tribe to be Ghost Wolves). That Krondarr is alone (or more correctly, the only surviver of his group) may well give a hint of his leadership abilities. However, having the party encounter Krondarr in Scrapwall loses the subtext of his fellow tribesmen not wanting him as their leader. Still, his greatsword will be most welcome against that Gearsman. Putting Jovrey’s gang in one of the unclaimed areas (E on the map) of Scrapwall is a good idea though (and avoids another random ruin), with the rest of the story playing out as written. Thank you Paizo Fans United for another great effort! There is always a thread soliciting submissions for the next issue of Wayfinder. Search the messageboards for "Wayfinder #17". Unfortunately, the deadline for issue 17 was on Jan 1st, but there should be a call going out for issue 18 once the shortlist for 17 has been chosen, and the dust settled. The thread for issue 17 contributions is already kicking around ideas for the next theme; if you follow that, you'll see what's leading the running, along with some of the reasoning behind why some themes get picked, or not. Dude, when you give directions like this, link the thread! There's a lot of contributors inspired by The Plain of Ten Thousand Swords, and the spooky goings-on there. Whoever came up with that in the original book needs a pat on the back. On that note, it may not be apparent, but the 'dark stranger' who protects three generations, in the song 'The Night Shepherd' is meant to be a shoki, and this is how the shokala (page 9) are sometimes made. There was a sample NPC, intended to be the girl in the last verse, but space was tight. I'm not entirely sure it's accurate, but the consignments page is telling me only 40 people have downloaded this issue. That suggests that only people who are interested in this issue are those of you who were published in it. PLEASE tell me that's wrong! It looks like the interest cycle for this issue only lasted about 1 week, too. Now that we are 2 weeks out from release, I'm assuming people have gotten a chance to read through it. We'd love the feedback! That's odd as I've downloaded a copy and I'm not a contributor of a it. An only 40 downloads does sounds low, so either the system is wonky or Iron God is not not too popular (But that could change with the current Paizo Humble Bundle). It probably has to do with the site going to Left-field yesterday. *sorry if this isn't the correct name for them, I don't have my copy with me atm. I just wanted to say thanks to Catherine Batka for the great illustration she did for my piece. Top notch! I thought the cover art alone would draw people to this issue. I think Paizo's counting kajigger is busted. I've downloaded every Wayfinder issue, and have never contributed (but, I would like to). In any event I still have an outstanding question (above) about one of the spells. Absolutely! It does have a duration of concentration +1 round, so it will take up your caster's turn to keep the buff up. It is also only 1 hardness per caster level up to the hardness of the object being siphoned. Still, a 10th level caster using a single 1st level spell slot to buff your front line melee could do worse with their action. I also imagine that chunk of steel would turn to mush and look pretty weird "melting" in your hand. Maybe you'll discover a new form of sculpture!